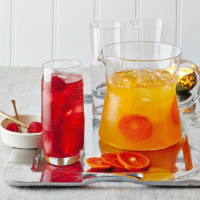 Get the party started with this easy-to-make Christmas cocktail. Make sure the spirits and mixers are chilled for refreshingly festive drinks – simply serve with a selection of nibbles and canapés. 1. Fill 2 highball glasses with ice cubes, then divide the gin and cassis among the glasses. Stir well, then top up with J2O and garnish each glass with a few raspberries.